In Europe nearly everyone has a rolling shopping cart. And today's market-goer will have nothing but a Rolser Joy Cart. 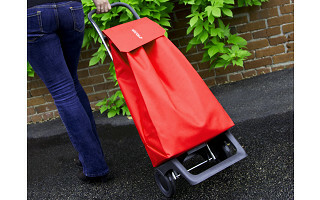 Chic, lightweight, collapsible, and a workhorse to boot, the Rolser weighs just 4lbs. but can tote up to 44lbs. Considered the Rolls Royce of shopping carts, the aluminum body and stylish cordura bag design will be coveted by other shoppers. It can fold flat and hang up when not in use. In addition to shopping, take it tailgating, on a picnic, to a concert, for a weekend away or to the laundromat and look stylish while doing it. Created by Joan Server Perez, Rolser Joy Carts are not just an attractive update to the old fashioned trolleys people once used to tote home groceries from the markets. The company is known for producing carts that are high quality, durable and long-lasting. These carts are made at a large and modern factory in Spain, and the company is just launching stateside distribution of their designs, so you can be among the first of your friends to own one. Look nice, wheel right with the Rolser. In Europe nearly everyone has a rolling shopping cart. And today's market-goer will have nothing but a Rolser Joy Cart. 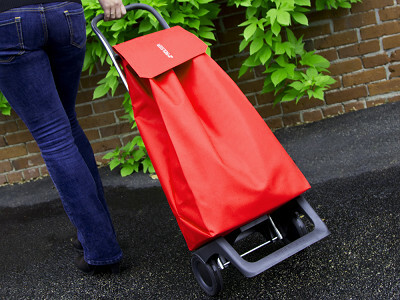 Chic, lightweight, collapsible, and a workhorse to boot, the Rolser weighs just 4lbs. but can tote up to 44lbs. Considered the Rolls Royce of shopping carts, the aluminum body and stylish cordura bag design will be coveted by other shoppers. It can fold flat and hang up when not in use. In addition to shopping, take it tailgating, on a picnic, to a concert, for a weekend away or to the laundromat and look stylish while doing it. Created by Joan Server Perez, Rolser Joy Carts are not just an attractive update to the old fashioned trolleys people once used to tote home groceries from the markets. The company is known for producing carts that are high quality, durable and long-lasting. These carts are made at a large and modern factory in Spain, and the company is just launching stateside distribution of their designs, so you can be among the first of your friends to own one.